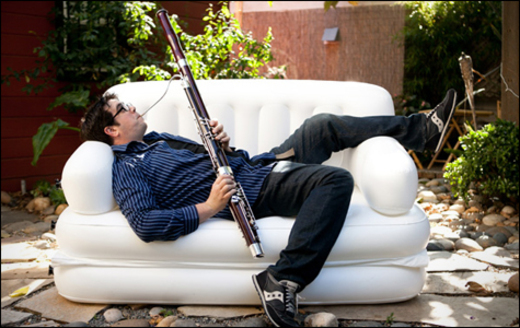 After studying classical bassoon at The Peabody Conservatory and ethnomusicology at UCLA, one might expect Oakland-based Scott Alexander’s songwriting to be atypical. His nonrepetitive pop does not disappoint. There’s no verse-chorus-verse-chorus-OhBabyOhBaby-chorus. Yet, despite abandoning traditional song structures that have been in place for millennia, Alexander does not leave his listeners disoriented. Instead, he creates something more catchy than experimental, and more clever than academic. Nonrepetitive pop is populist. These are songs that start conversations among friends and strangers alike. In fact, Scott Alexander so earnestly wants to engage his audience that he brings homemade cookies to every show, and also frequently shares them with strangers while perched on an inflatable couch at a variety of unexpected locations. Really. With lyrics that are sharp and direct, Scott Alexander’s songs often stare awkward right in the face, moistening a napkin to wipe something off its chin. Playing with words as much as he does structure, his humor eases the tension he creates. This music won’t make you forget about everyday life, but rather help you get through it. Scott Alexander Gets Distracted is his latest suite and a meticulous, DIY production. These five songs take a not-so-obvious look at everyday diversions. Their nonrepetitive nature, however, will compel you to focus on every word.